Start by choosing the model that suits your room. Chances are you already have a corner free, since most furniture doesn’t suit well to being pushed into a corner. 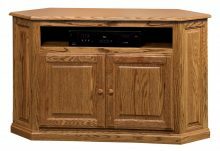 Our solid corner Amish entertainment centers are designed to make use of this wasted space and maximize your TV and storage space. Next, you select the wood you like. 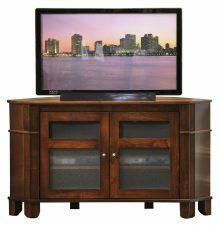 Our corner entertainment centers are available in popular hardwoods like oak, cherry and maple. Not only are these northern kiln-dried woods solid and durable, but they contain beautiful natural grains, making each piece of furniture unique. Finally, choose from over a dozen different stains for that perfect finish. Giving you a choice in stains allows you to perfectly match your solid wood entertainment center to your décor. Our stains not only look fantastic and highlight the natural beauty of the hardwood, but they also protect your piece from wear and tear. You might be worried that your room is too small for an entertainment center, or that you won’t be able to find one that suits the style of your existing furniture. No worries! 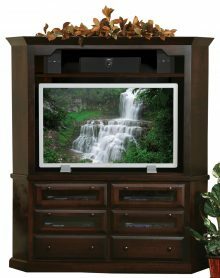 As you can see, with so many customizable options, including compact models for tight spaces, there’s a solid wood entertainment center for every home. You want to be sure your valuable electronics arent resting on cheap, poorly constructed furniture. 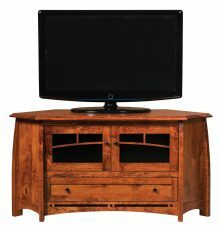 Every entertainment center we sell is made from solid, sturdy northern kiln-dried hardwoods. 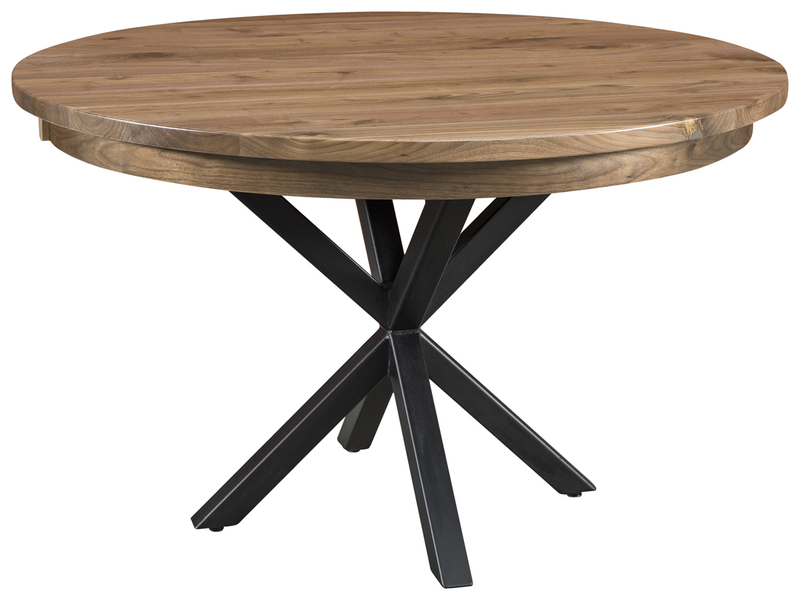 Choose from traditional favorites such as oak, cherry or white oak. With the expert Amish craftsmanship that goes into every piece, youll never have to worry about the quality and longevity of your entertainment center. The same can’t be said for low-cost, mass-produced furniture. Often produced in foreign countries, this type of furniture that you find in big box stores or in catalogs is built with little regard to how long it lasts. 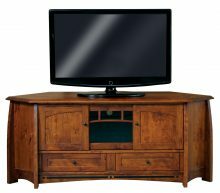 Often it is designed to be disassembled for transportation and reassembled again later, and as a result, it simply can’t have the same solidity and alignment of a proper solid wood entertainment center. The other concern with foreign-made furniture is that you have no idea in what conditions it was made. From a lack of respect for the health and safety of the workers to the impact its manufacture has on the environment, you’re in the dark when your furniture comes from an unknown location. This is on top of the use of harsh chemicals and glues, which often emanate from this low-cost furniture when you get it into your home. Contrast that with Amish-made furniture crafted right here in the USA. 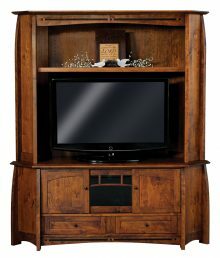 Amish artisans will build your corner entertainment center using the same time-honored traditions of their ancestors. You are keeping jobs close to home and perpetuating the lifestyle of these hardworking people. 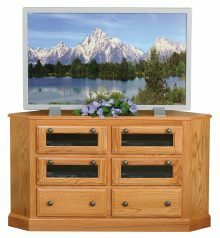 You’ll take pride every time you look at your beautiful Amish entertainment center, knowing that there’s a real story behind it and that it was built just for you according to your wishes. If youre looking for the best value for your furniture dollar, youll always find it at AmishOutletStore.com! 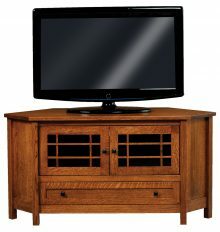 Purchase any entertainment center right now and get up to 33% off the regular retail price. Other ways to reduce your home furnishing costs include our large-order discount, which can save you up to an additional 13%, as well as our 3% discount when paying by check. With savings like that, you can get the quality, style and durability you like without breaking the bank. 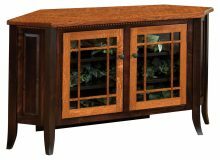 And since most of our entertainment centers are part of complete living room collections, you can easily find matching items for furnishing your entire room. 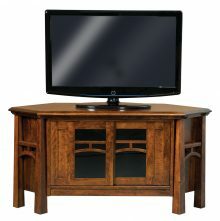 Browse our huge selection of beautiful solid wood Amish Corner Entertainment Centers and order one for your home today!